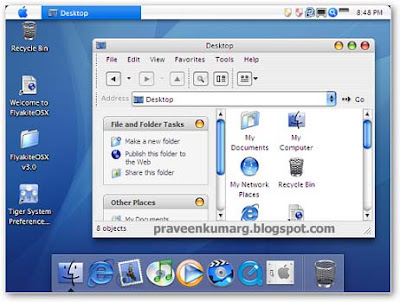 Make your XP look like Mac OSX. Leopard, to be precise. There are two ways to accomplish the OSX look: the easy way – with a transformation pack, and the hard way – manually. I will, of course, show you how to do this the easy way. 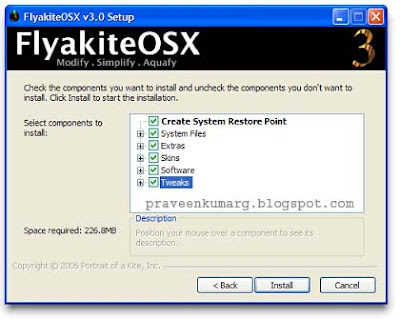 The best Mac OSX transformation pack for Windows XP is probably FlyakiteOSX. Run the installer and when you get to the following screen, MAKE SURE you check the box Create System Restore Point. The transformation pack will change a lot of system files and settings and although you should be able to uninstall easily later, you might find yourself in a mess if something goes wrong. This way you can always do a System Restore. Check any other options you want and you’re ready! After the restart, you should be able to convince all, but the most die-hard Mac lovers that you have an OSX. Like other good transformation packs, this also leaves you a nice Mac OSX shutdown screen, logon screen,wallpapers etc. Note: The transformation pack might trigger your anti-virus protection as it changes some system files, but this is probably a false positive. Be careful though, and remember to back up!